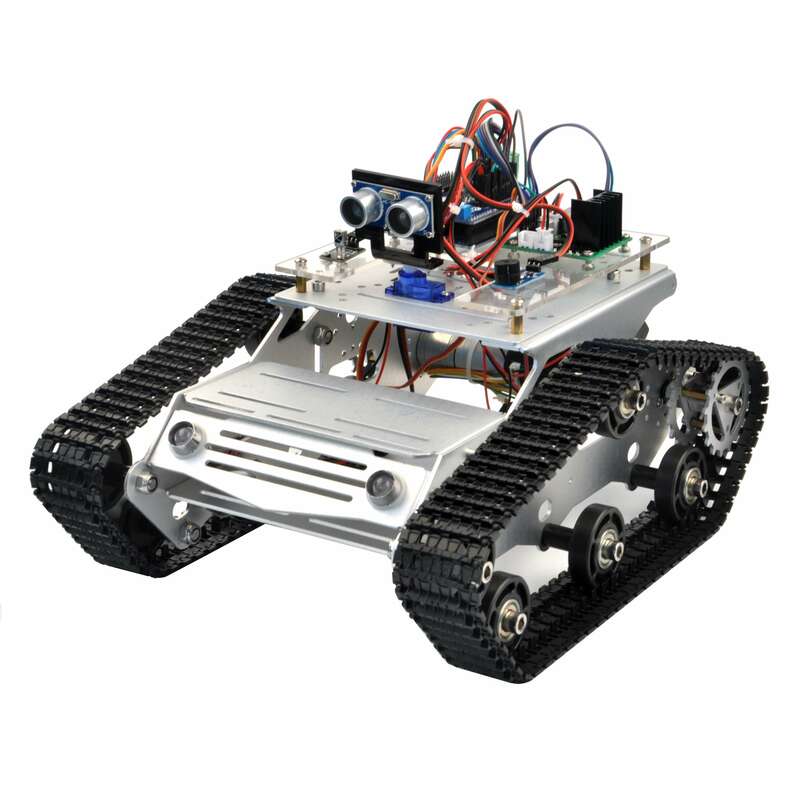 In this lesson, we learn how to control the Robot car mobile APP through WiFi and Bluetooth. , we just use the ESP8266 Wifi board as expansion board and control the tank car via IR receiver in previous lessons. In this lesson, we will learn how to use the phone to connect the hot spot from esp8266 board and control the car movement via phone app. At the same time, you also can put the bluetooth into the esp8266 board and control the car movement via phone bluetooth. 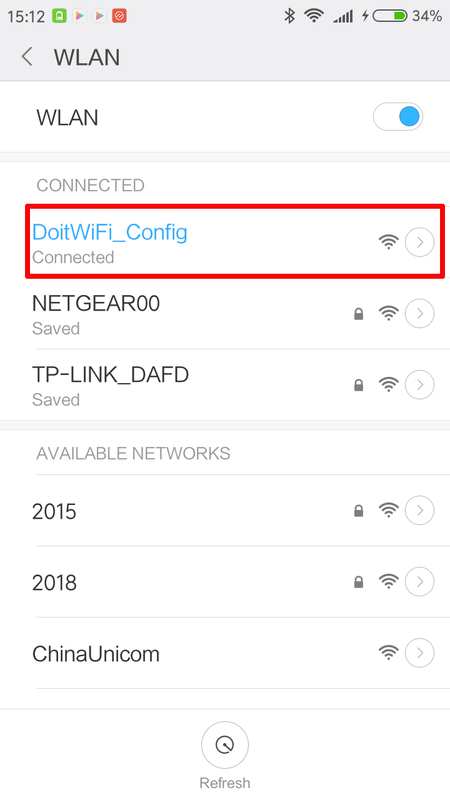 There is a hot spot called DoitWIFI_Config from ESP8266 board in working time and you could connect the hot spot via phone wifi without password. 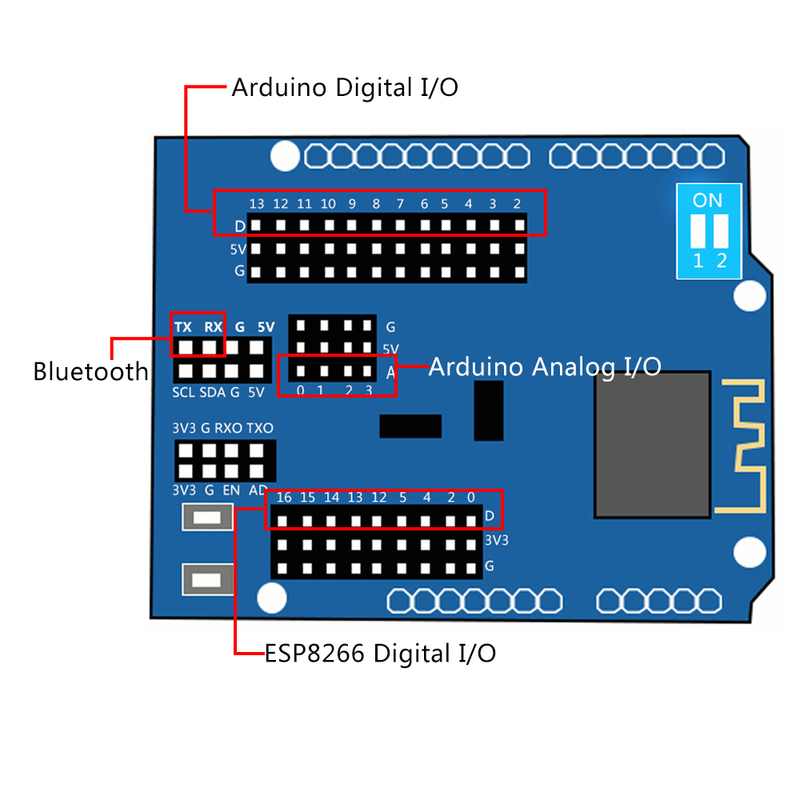 When turn the switch of ESP8266 board to “ON”, the message from the arduino and esp8266 can be exchanged by serial ports.The control command can be send to ESP8266 via phone app and then send to arduino via serial ports between arduino and ESP8266 board. 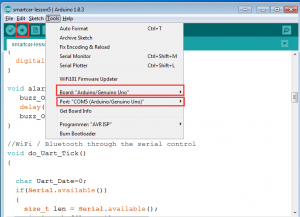 When turn the switch of ESP8266 board to “1” and “2” position to disconnect the serial ports between arduino and ESP8266 board. 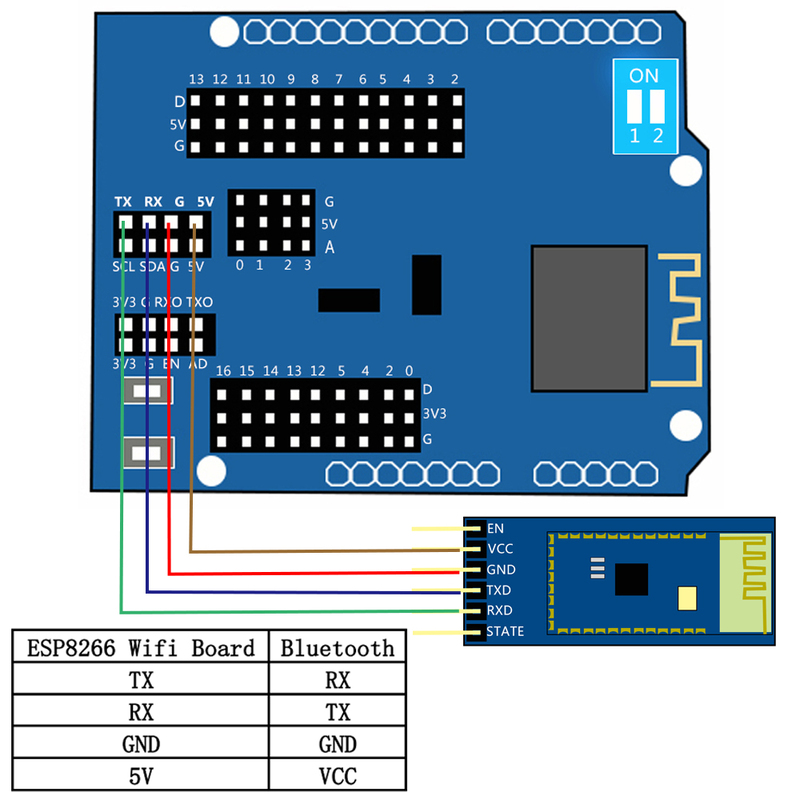 If you put the bluetooth module on esp8266 board and connect it via phone bluetooth, the message from the arduino and esp8266 can be exchanged by serial ports via bluetooth module. Find more about the ESP8266 Wifi shiled board, please click here. Step 2:Download Lesson 7 sample code from http://www.kookye.com/download/car/tank_robot_lesson7.zip, unzip the download zip file tank_robot_lesson7.zip, you will see a folder called tank_robot_lesson7. 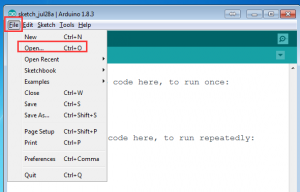 Step 3: Connect UNO R3 board to PC with USB cable, Open Arduino IDE -> click file -> click Open -> choose code “tank_robot_lesson7.ino” in tank_robot_lesson7 folder, load the code into arduino. Step 4: Choose corresponding board and port for your project,upload the sketch to the board. Note: This app can just support Android and we offer the app source code( http://kookye.com/download/car/BTcar-master.zip). You could revise and personalize the code as per your needs. This program is used to receive the control command from phone app. Step 1: Install ESP8266 Expansion Board on UNO R3 board. 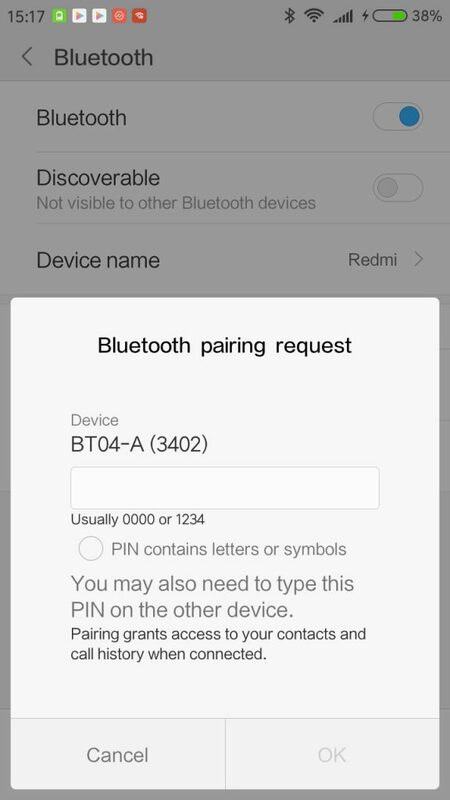 Step 2: Put the bluetooth module into ESP8266 wifi Board as the following picture. Step 3: Put two 12865 batteries into battery box and turn the swith of box to “ON”. 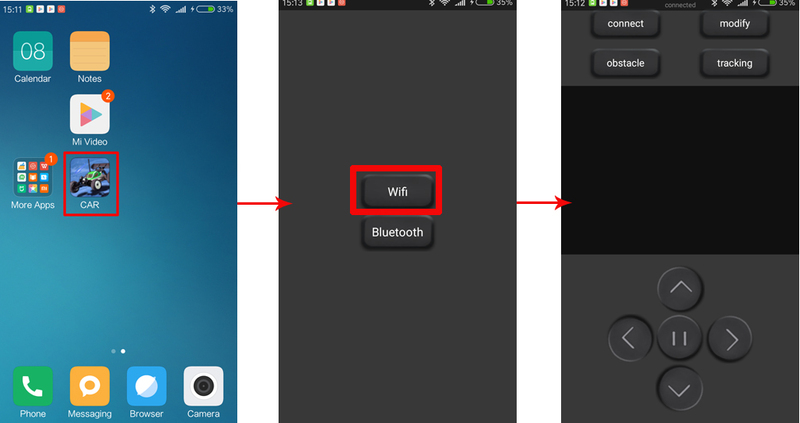 Step 4: Open phone app and wifi, find the hot spot called”DoitWIFI_Config” and connect it. There are three working mode: manual control, obstacle avoidance and tracking. Users can switch freely among three working mode. 1) In manual control mode, you can click buttons (^) (V) (<) (>) to control the Robot car to move forward and backward, turn right and left. Meanwhile, the APP can observe the car real time movement. 2) Click “tracking” button of App to switch the current mode to tracking mode. The Robot car will move forward along the black line in white background. Meanwhile, the APP can observe the car real time movement. Press “||” button to stop moving and click other button to change Robot car working mode. To learn more about this mode, please review our lesson 4. 3) Click “Obstacle” button to switch the current mode to obstacle avoidance mode. The Robot car can be driven forward continuously and stopped and steered away once any obstacle in its way. Press “||” button to stop moving and then click other button to change Robot car working mode. To learn more about this mode, please review our lesson 5.